Since the beginning, the voices of these pioneering alpine singers have echoed their natural habitat and popular vocation. The SOSAT songs had an “instinctive” nature, inspired by the mountain rhythms, a love for its landscapes and faithfulness to its values. 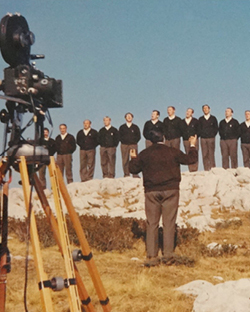 The choir’s ethos was simple, based on the principles of solidarity and of purest socialism, with SOSAT’s father, Nino Peterlongo, as its guardian. It was Peterlongo to whom, in 1927, Toni Ortelli – through Leo Saiser, a student attending university in Turin and one of the first choristers – gave the melody and the text of “La Montanara”. Saiser invited Mario Pedrotti and Tullio Antoniutti – the choir’s “trailblazers” – to listen to it; shortly after that, “la Montanara” was already being sung by ear. Toni Ortelli himself taught it to the choristers during the evenings they spent together along the river Adige: they instinctively worked out harmonies for the new song and included it in their own repertoire. Luigi Pigarelli finetuned it and wrote the final part. It is quite likely that it was officially performed, for the first time, in Rome. Pigarelli followed the musical growth of the SOSAT choir, to which he contributed, for instance, by composing in 1925 “La Paganella”, one of the milestones in the history of this musical genre. Just as Antonio Pedrotti and Luigi Pigarelli were the first great musicians to contribute to the creation of an extraordinary repertoire of alpine songs, “La Montanara” came to be known as the archetypal alpine folk song, as well as the hymn of people living in the high mountain valleys. Now the door was open to welcome precious contributions from other illustrious musicians and singers such as Arturo Benedetti Michelangeli, Andrea Mascagni, Renato Dionisi, Franco Sartori, Camillo Dorigatti, Luciano Fumai and many others, who would follow the unforgettable example of Luigi Pigarelli and Antonio Pedrotti. They have built up a repertoire which is still the backbone of alpine popular songs. Their harmonies have provided a soundtrack for the lives of many choristers and mountains lovers and, more generally, for the regional history. Several songs and harmonies have enriched it, but we can’t forget that at the origin were the notes composed by Ortelli and Pigarelli; if nowadays over six thousand people from the 200 choirs scattered throughout Trentino can, ideally, sing together “La Montanara”, this is because some people have never stopped singing it with the same spirit that moved them the first time.